Norman Eugene Hoffarth was born August 9, 1932, in Texas County, Missouri, to Don and Vedia (McCall) Hoffarth, and passed away March 18, 2019, at his home in Vanzant, Missouri. He was 86 years, 7 months, and 9 days of age. He attended elementary school at Fowler School through the eighth grade, and then attended Mountain Grove High School where he graduated in 1950. After high school, he went to work for Caterpillar in Illinois, but very soon he was called to serve his country. 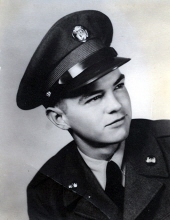 Norman joined the United States Army and was sent to Korea, and he also spent time in Japan. With his duty served, he was honorably discharged in 1953. Norman then worked at a steel plant in Leavenworth, Kansas, where he lost part of his finger. In 1958, he went to work for Aliss-Chalmers as a welder in Independence, Missouri, and worked there until 1965. During this time, Norman married Joan Harris on June 13, 1959, at the preacher’s home near Drury, Missouri. Two children were born to this union, Carrie and Dwight. He and his family moved to Vanzant, Missouri, and he worked for 26 years at Dairy Farmers of America in Cabool, Missouri, retiring in 1991. Norman was saved and baptized in the 1970s, and he joined Victory Church in their neighborhood. He was happy taking care of his farm, and attending and helping out at his church. He also enjoyed their Bible studies and discussions that they would have at church. He belonged to the Masonic Lodge in Willow Springs and enjoyed attending meetings as long as he was able. He recently received his 50 year pin as a Mason. He enjoyed two fishing and hunting trips to Alaska with his late brother-in-law. He and Joan enjoyed several trips, with two grandkids, to several national parks and to many shows in Branson. Reading was one of his pleasures, and he especially enjoyed western books. Louis L’Amour books, as well as other authors, had a special place near his rocker. Norman was a good husband, father, and grandfather, and he was always there for all of his family. Norman was preceded in death by his parents, Donald and Vedia Hoffarth. He is survived by his loving wife of 59 years, Joan Hoffarth, one daughter, Carrie Schafer, one son, Dwight Hoffarth, five grandchildren, Abram Hoffarth, Haley Hoffarth, Tyler Hoffarth, Brandy Howell, and Brittany Russell, eight great-grandchildren, two great-great-grandchildren and one on the way, one brother, Rudy Hoffarth and his wife, Marilynn, one sister-in-law, Jutta Harris, and many nieces, nephews, cousins, neighbors and friends who will miss him. To send flowers or a remembrance gift to the family of Norman Eugene Hoffarth, please visit our Tribute Store. "Email Address" would like to share the life celebration of Norman Eugene Hoffarth. Click on the "link" to go to share a favorite memory or leave a condolence message for the family.